Water is the element that remembers and the vital link that imparts knowledge and communication. A drop of water is the DNA that contains the entire ocean of all memory including past, present, and future. As long as water continues to flow, so will life. Each year, Americans spend 50 billion dollars on plastic bottled water. This is equivalent to $1,500 worth of plastic bottles per second. In 2014 the San Francisco the first city in the world to ban bottled water. Instead of focussing on recycling these water bottles, they are looking to be completely waste-free by 2018. Click here to watch this video in it’s entirety. Growing Concern Over Bottled Water Amid California’s Drought. These ladies visit our tap station in Yerba Buena Park in California every week, to fill up their reusable bottles. GLOBALTAP thanks Dan Verakis for sharing this amazing picture. Public drinking water accessibility is more than a convenience, it is a necessity. 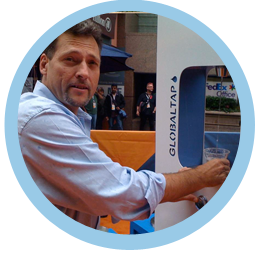 Please share with us, when you see our GLOBALTAP stations next time. Let us know how you like them or if you would like, one of our water fountains in your neighborhood or in your community. Laura Schwecherl explains twelve good reasons to drink water this year, and how to make water the number one choice when you are thirsty. Avoid soft drinks that can cause many health issues, and switch to water in 2015. Check out this youtube viral video of a man walking on water. No he’s not Jesus. Two hikers walking on ice that is crystal clear in Tatras Mountains in Slovakia. Stunning. TorontoOnTap is a program designed to increase water bottle filling stations in high traffic areas in Toronto by Clean Water Foundation. We are happy that they have chosen GLOBALTAP for this great task. This program is also working with private and public organizations in Toronto to provide water bottle filling stations throughout the city to deliver easy access to tap water at any time to the locals. Water Fasting, Best Detox Cleanse: What do you think? Tyler Tolman, explains from this video how you can benefit from water fasting. Means no food but water. He claims that there are many water fasting benefits including how the brain can grow and can make you more intelligent when you fast. By fasting you give your body a chance to breath and clean with the help of water. Let us know what you think? Plastic and music industry seems unrelated but the enormous amount of plastic wastes in concerts are inevitable, especially due to the popularity of the simple single-use containers for beer, water and soda. But according to Dianna Cohen, an environmental activist/artist there’s hope. She is also a co-founder of the Plastic Pollution Coalition, a global alliance of individuals, organizations and businesses working together to stop plastic pollution. Cohen’s project Plastic Free Touring sprouted out from her broader Plastic Free Living initiative. The project encourage touring performers to reduce their plastic footprint on the road and how to do so. The Coalition has worked with artists such as Jackson Browne, Ben Harper and Crosby, Stills and Nash as well as Bonnaroo Music and Arts Festival to provide fans and artists with reusable, stainless-steel containers to use instead of disposable cups. She hopes to spread this project in all the major music festivals to promote reusable containers and to advocate to break the addiction of bottle water in recent years. Sarah Smith, a 42 year old mother in the UK decided to document and photograph of herself to experiment what happens if she drank 3 liters of water everyday for an entire month. She wanted to see if water is the solution for her poor indigestion and regular headaches. Here’s the result. End of week one, she improved bowl function, no more breakouts and headaches and she also improved her issues with joint stiffness. End of week two, she noticed a slight improvement in her skin, visibly flatter stomach, no more cellulite and another week without headache. End of week three, her dark circles and eye wrinkles had disappeared and her skin has become plumper. She also noticed a behavioral change. She had started to intake less food and felt hunger less frequently. In the end of the final week, she noticed all the dark shadows around her eyes have disappeared as well as the blotches. No more regular headaches. She felt leaner, fitter and healthier just by changing the intake amount of water. Read more about the Sarah Smith Story here. And drink more water for a healthier life style. We all know what happened in the election few days ago. Berkeley city in California definitely made history in this election to be the first city in the nation to impose a tax on sugary drinks. Berkely Vs. Big Soda advocacy group worked hard and lobbied for this victory as a part of their Healthy Child Initiative campaign. There will be a $0.01 per ounce tax on all beverages sweetened with sugar ( except alcohol, dairy products and drinks for medical purposes). The revenue of this tax will support the city’s health and health education programs. This indeed shows how America is ready to fight for a healthier society and let’s hope there will be many cities and states that will follow Berkeley’s lead to a healthier America. Growing Concern Over Bottled Water Amid California's Drought.